Blake, the guy who hates Whaboom and still won't stop talking about it, comes to Paradise and no one is very receptive to him and his sweat glands. Blake invites Kristina on his date but she declines given her unique romantic conundrum (and lack of interest in Blake). 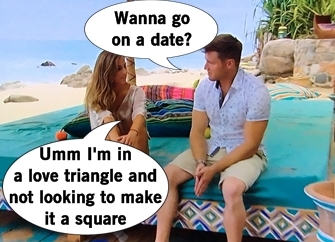 Christen ends up accepting the date with Blake. The women are more receptive to Fred, the guy who Rachel knew as a kid, who shows up shortly after Blake. Eventhough Dominique has a thing with Diggy, she accepts Fred's invite. 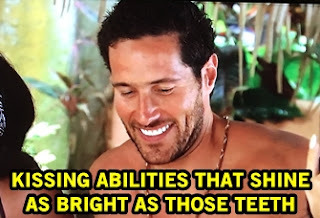 Blake, Christen, Dominique, and Fred go on a group date together on speed boat while Christen nearly barfs on the boat and then almost loses a contact. Dominique and Fred have a blast, but Diggy is nervous about where he stands if the couple hit it off. The last date of the week is for Robby and Amanda to get all cutesy at a street carnival and then light off fireworks low enough to nearly kill the attendees. Some gossip is spreading around Paradise that Jack Stone is a bad kisser. Jasmine, the self-proclaimed Queen of Paradise, earlier kissed Tickle Monster because she was intrigued. Well Jack is no exception and if anything, maybe she can help. A few shots later, Jasmine smooches Jack and he's a good kisser. Soon enough, Jack's a hot makeout commodity, kissing D.Lo and Raven. So world, please know that Jack Stone is a certified good kisser. Chris Harrison shows up mid-day to announce there's no new arrivals coming and the Rose Ceremony is that very night. Time for all the guys to hustle to get the ladies' roses. Ben Z decides to stop the hustle and decides to leave since he hasn't found a romantic connection. This is great news for his dog! Diggy puts his feelings for Dominique out there, with them playing a Q&A game that lets Diggy grab a kiss to show his interest. 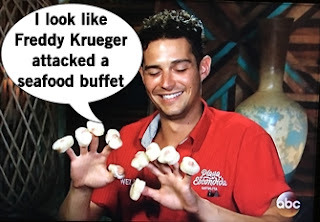 Christen learns from bartender Wells that everyone calls her "Scallop Fingers" and can't understand the persecution for taking home leftovers. Fish fandom be damned, Christen is high in demand in Paradise with three guys hoping to receive her rose (Jack Stone, Tickle Monster, Blake). If you viewers are as tired of the Dean triangle, sounds like everyone living in Paradise is over Dean's antics. Dean's guilty when he finds out Kristina saw his pool frolic session with Kristina. D.Lo is also tired of being the other woman. Dean finally makes a decision and after stringing Kristina on for weeks, he chooses D.Lo. Kristina is pissed and goes to Raven for advice and reassurance. Raven tells Kristina to not be mad at D.Lo; Dean's the player. But Kristina doesn't want to hear her friend take D.Lo's side, when Kristina holds both D.Lo and Dean accountable. Bartender Wells offers the sage wisdom Kristina needs, proving to be a wonderful fill-in for Jorge. The Rose Ceremony begins with the obvious roses: Lacey/Daniel, Taylor/Derek, Amanda/Robby, and Raven/Adam. Now onto the more suspenseful choices. Dominique gives her rose to Diggy over Fred. Queen of Paradise Jasmine, a total wildcard, extends her rose to Tickle Monster. 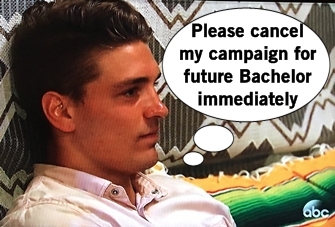 Christen isn't pursued by Blake's attempts at a scallop bribe; she chooses Jack Stone. So now comes the big question: who will Dean accept a rose from? 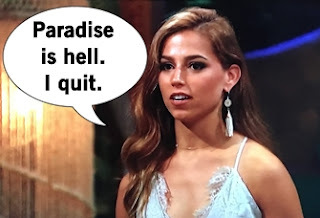 Kristina gets to the podium first and gives a speech about wanting to be valued and put first in a future relationship, so she does not give out her rose and leaves Paradise. Dean looks down in shame and offers to walk Kristina out and apologize for the 80th time. Dean heads back to the Rose Ceremony and then accepts the final rose of the evening from D.Lo. Fred and Blake end their one-day vacation in Paradise leaving no impact to the point that I'll forget they were even on this show tomorrow.